...but why would you want to when establishing a good weight loss support system could mean the difference between success and failure? I probably don't have to tell you that having someone on your side - someone you can share with as you try to diet successfully - can be a powerful thing. There is research showing that such accountability and support is more likely to lead to a positive outcome. That's why I was SO excited when I stumbled upon a fabulous FREE online resource. I've always recommended weight loss support groups, but I think I've found the best free weight loss support you could ever ask for: a program where you can choose a dieting partner for yourself. Thank goodness someone else did! Some of the most established weight loss/diet programs feature support groups. What's new here is using the internet to pick the right partner(s). ...planning your diet, tracking your diet, charting your progress, etc. You can enjoy even more free weight loss support by joining the conversation on one of the many topics posted in the message boards. Establish contact not just with your weight loss buddy but with all the buddies! Talk about accountability! You announce your weight loss intentions to the whole internet! Start with the free "Basic" membership and hold off on the "Premium." Why? Because there are plenty of new things to incorporate into your life just with the free stuff. Treat yourself to the whole thing for a cost of about 11 cents a day. Free Weight Loss Support - takes you right to the page where you sign up for the free version. Find a Buddy - locate dieting friends right from this page. 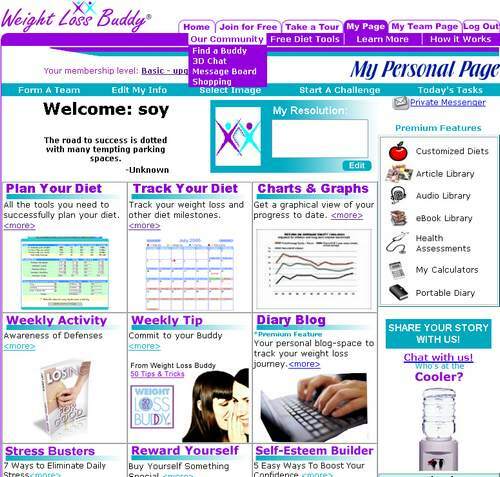 Weight Loss Buddy is one tool to add to your weight loss toolbox. It's certainly not the ONLY tool you should have in there. For one on one nutrition and diet help with a Registered Dietitian, contact me.